Reliever Kyle Hunter delivers a pitch on Saturday night. DID YOU KNOW? : that despite the Generals’ 41-52 record this season Jackson has a winning record, 21-20 against South Division opponents. GENERALS RECAP: The Generals scored a run in the bottom of the 8th inning to take a 5-4 lead, but allowed 1 run in the top of the 9th inning to tie the game and 2 in the 11th as Jackson lost to Mississippi 5-7 in 11 innings on Saturday night. RF James Jones (3×6, R) led the team with 3 hits, while, DH Steven Proscia (2×4, R, BB), CF Denny Almonte (2×5, RBI) and LF Jack Marder (2×3, R, HR, 3 RBI) each recorded 3 of the Generals 10 hits. Starter Trever Miller (6.0,5,4,4,2,2,HR) allowed 4 runs on 5 hits in 6.0 innings, but did not figure into the decision after leaving with a 5-4 lead. LH Kyle Hunter (1.1,3,0,0,0,1) and RH Tyler Burgoon (0.2,0,0,0,0,0) combined to hold the Braves scoreless over the 7th and 8th innings. RH Carson Smith (1.0,0,0,0,3,1) allowed the tying run to score in the top of the 9th inning, while RH Andrew Kittredge (2.0,4,2,2,2,2) picked up his 3rd loss after allowing 2 runs in the top of the 11th inning. • SEATTLE GENERALS:…there are currently (7) players on the Seattle Mariners active roster that were members of the 2012 Jackson Generals (INF Nick Franklin, INF Brad Miller C Jesus Sucre (15-day DL), C Mike Zunino and RHP Yoervis Medina, LHP Bobby LaFromboise, RHP Stephen Pryor (60-day DL). In total, (9) 2012 Generals have made their MLB debuts and (3) 2013 Generals. (C Brandon Bantz, RHP Hector Noesi, INF Brad Miller). • THE HOME STRETCH: The Generals are in the midst of playing 25 games in 25 days and 45 games in 47 days to close out the 2013 regular season. At the conclusion of the current series the Generals will have 15 home games and 25 road games remaining. • WE GOTCHA! !…Jackson catchers lead the SL catching 53.2% of base stealers (50 CS, 94 Att). The next closest is Birmingham which is throwing out 35.8% of base runners. Generals 1B Steven Proscia delivered a walk-off single in Friday’s 4-3 extra-inning win over the Missisppi Braves. Proscia talks about the hit as well as how the club has played the last few days. Steven is 21 years old from Sufferin, NY and attended the University of Virginia. He was the Mariners 7th round pick in the 2011 draft. 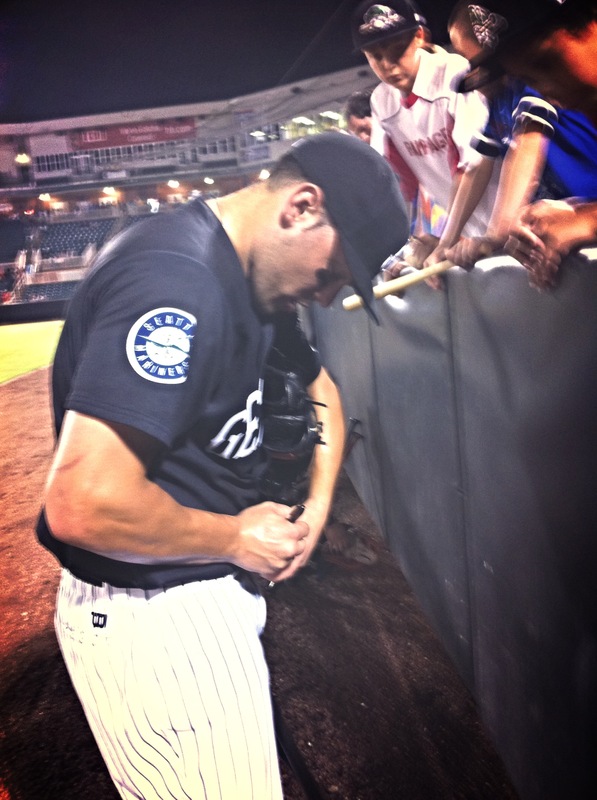 Steven Proscia signs autographs for fans after last night’s walk-off winner. 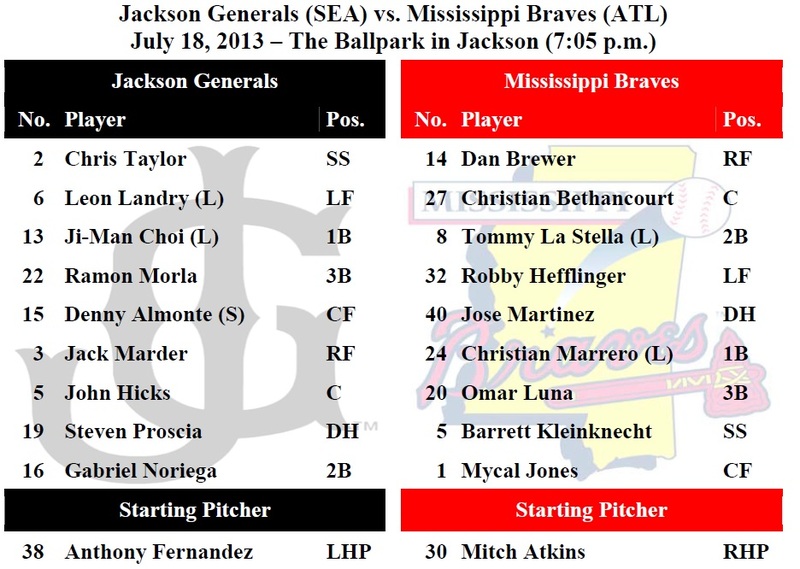 TODAY’S GAME: the Generals continue their 10-game homestand (2-5) tonight with game #3 of the 5-game series with the Mississippi Braves at The Ballpark in Jackson…this is the M-Braves’ first and only visit to Jackson this season. 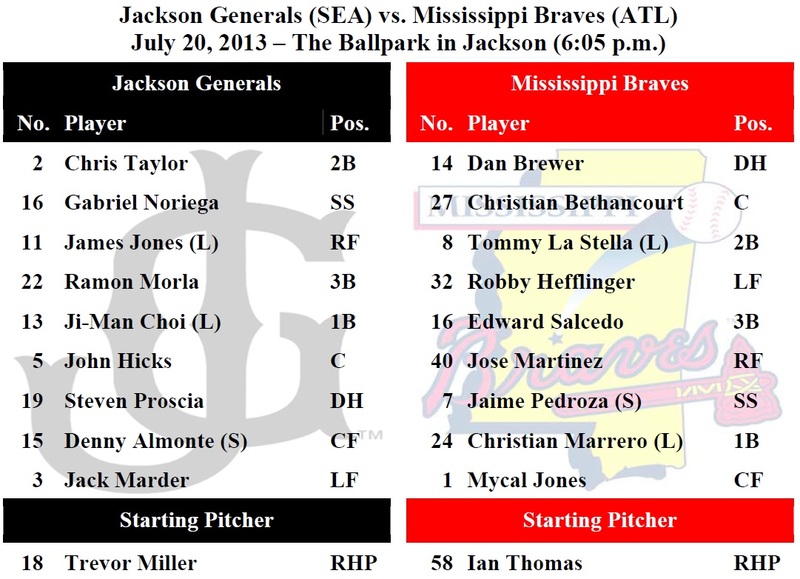 The Braves lead the season series 4-3 while Jackson leads the all-time series 84-82…22-year-old RHP Trevor Miller makes his Double-A debut today in the middle game against the Braves. Miller was 4-7 with a 4.82 ERA in 18 starts for A+ High Desert this season. DID YOU KNOW? : that the Generals are in a stretch of playing 45 games in 47 days to close out the 2013 regular season. The Generals are currently in a stretch of 25 games in 25 days. Jackson will play just 17 more home games, with 25 games coming on the road to end the year. GENERALS RECAP: 1B Steven Proscia hit a walk-off single scoring 3B Ramon Morla in the bottom of the 10th inning as Jackson defeated Mississippi 4-3 on Friday night. 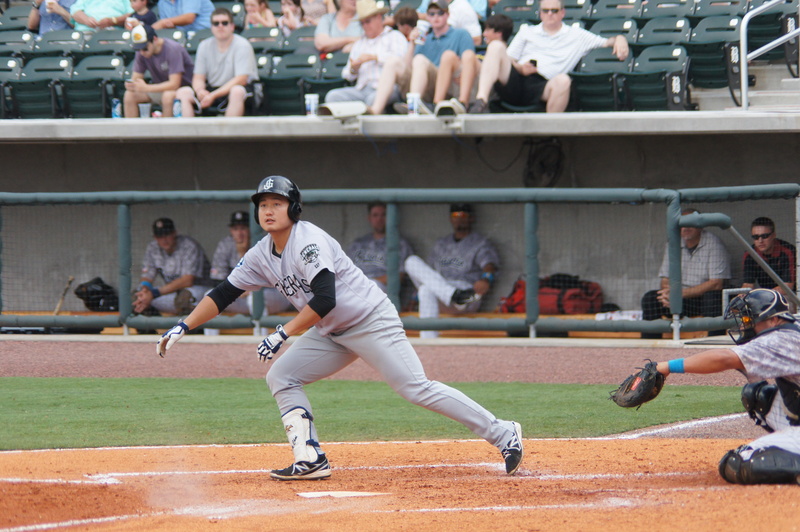 Proscia’s single snapped his 0-for-25 hitless streak, dating back to July 8 at Pensacola. SS Chris Taylor (2×4, R, 2B, RBI, BB) and DH Ji-Man Choi (2×4, R, RBI, BB) combined to recorded 4 of Jackson’s 7 hits, while Prosica (1×5, R, RBI), RF James Jones (1×4, BB) and C Michael Dowd (1×3) each recorded 1 hit. Starter Anthony Vasquez (6.0,6,2,2,1,3,HR) allowed 2 runs on 6 hits in 6.0 innings, but did not figure into the decision. RH Stephen Kohlscheen (1.1,2,1,1,0,3,HR) allowed a run in the top of the 8th inning, while LH Nick Hill (0.2,2,0,0,0,1) and RH Dominic Leone (2.0,0,0,0,0,4) combined to hold the Braves scoreless over the final 2.2 innings. Leone earned his first career Double-A win after striking out 4 in 2.0 hitless innings. NEWS & NOTES: 36 of first 92 games have been 1-run games (14-22) which is the 5th in all of minors…50 of 91 games have been decided by 2-or-fewer runs (18-32) and 11 have been extra-inning games (4-7)…In games decided by 3+ runs the Generals are 23-18. • ALUMNI REPORT: Opening day Jackson shortstop Brad Miller was 3-for-5 with his first 2 Major League home runs and 5 RBIs last night in Seattle’s 10-7 win at Houston. Miller is batting .273 after three weeks in the Majors. • CLOSING TIME: After allowing 5 runs over his first 6 appearances of the season, RH Carson Smith has allowed only 4 earned runs over his last 25 relief appearances. During this stretch he is 0-1 with 7 saves and a 1.33 ERA (4 ER, 27.0 IP). Since April 22, Smith has lowered his ERA from 8.44 to 2.51. Smith has struck out at least 1 batter in 27 of 31 games, including recording 15 strikeouts over his last 9 appearances. • ALL ABOUT THE JI-MAN: Quietly, 1B Ji-Man Choi is having one of the best seasons in the Mariners farm system. Overall this season in A+ and AA he is batting .299 (86×288) with 13 home runs and 58 RBI. He ranks 9th in AVG, 4th in HR’s and 4th in RBI in the organization. • WE GOTCHA! !…Jackson catchers lead the SL catching 53.8% of base stealers (49 CS, 92 Att). The next closest is Birmingham which is throwing out 36.2% of base runners. Generals All-Star outfielder James Jones delivered a clutch pinch hit 2-RBI triple on Thursday night that led to the Generals 8-3 win over the Mississippi Braves. Jones talks about the big hit as well as his long travel day back from the All-Star game in Jacksonville earlier on Thursday. Anthony Vasquez starts tonight and has a 0.95 ERA so far during the month of July. 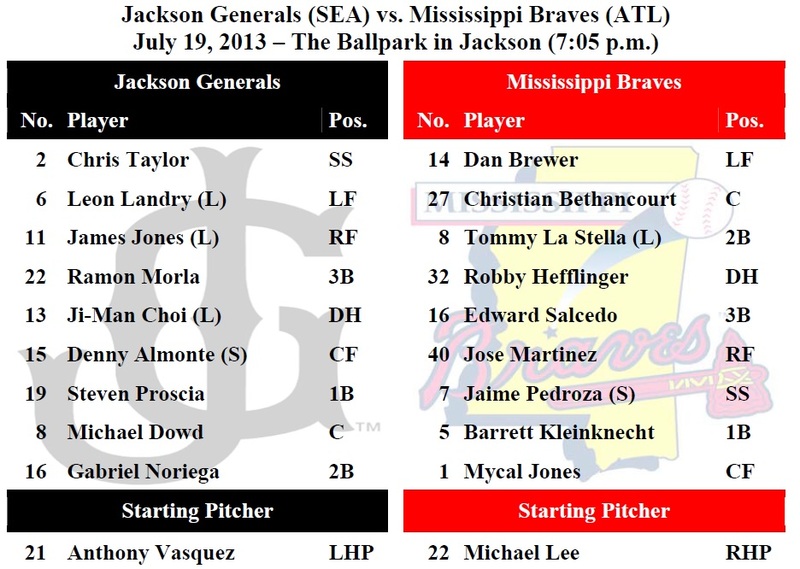 TODAY’S GAME: the Generals continue their 10-game homestand (1-5) tonight with game #2 of the 5-game series with the Mississippi Braves at The Ballpark in Jackson…this is the M-Braves’ first and only visit to Jackson this season. The Braves lead the season series 4-2 while Jackson leads the all-time series 83-82… 26-year-old LHP Anthony Vasquez makes his 5th Jackson start of the season and 8th overall in game 2. In 3 starts so far in July, Vasquez is 1-0, with a 0.95 ERA, holding opponents to a .145 average. DID YOU KNOW? : that the Generals collected 3 triples last night in the 8-3 win over the M-Braves. That runs the season total to 24 which is 2nd-most in the Southern League this season. 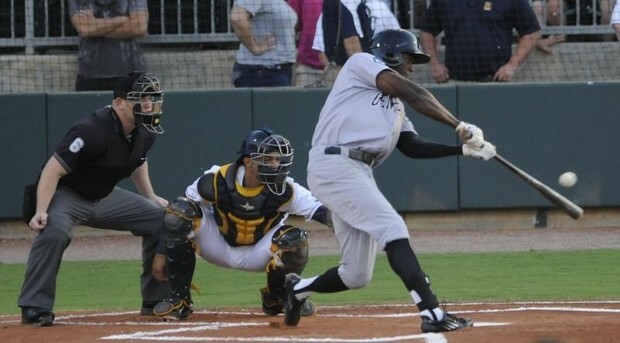 James Jones has 9 which is T-1st in the Southern League. GENERALS RECAP: The Generals scored 5 runs in the bottom of the 8th inning as Jackson came-from-behind to defeat Mississippi 8-3 on Thursday night. SS Chris Taylor (4×5, 3 R, 3B, RBI, SB) led the team with 4 hits, while 2B Gabriel Noriega (3×4, R, RBI), LF Leon Landry (2×4, 3B, 4 RBI, BB) and 3B Ramon Morla (2×4, SB) each recorded multi-hit contests. Starter Anthony Fernandez (6.0,2,2,0,2,4) allowed 2 runs (0 ER) on 2 hits in 6.0 innings, but did not figure into the decision. Relievers RH Tyler Burgoon (1.0,2,0,0,0,2), RH Stephen Shackleford (1.0,2,1,1,0,0,HR) and RH Carson Smith (1.0,0,0,0,0) combined to allow 1 run in 3.0 innings in relief to close out the game. Shackleford recorded his first Double-A win, despite allowing a solo home run in the 8th inning. NEWS & NOTES: 35 of first 91 games have been 1-run games (13-22) which is the 5th in all of minors…49 of 91 games have been decided by 2-or-fewer runs (17-32) and 10 have been extra-inning games (3-7)…In games decided by 3+ runs the Generals are 23-18. • ALUMNI REPORT: Tacoma C Brandon Bantz was 3×4 with a R, 3B, RBI to lead the team last night, but Tacoma lost 8-7 to Fresno. • ALL ABOUT THE JI-MAN: Quietly, 1B Ji-Man Choi is having one of the best seasons in the Mariners farm system. Overall this season in A+ and AA he is batting .296 (84×279) with 13 home runs and 57 RBI. He ranks 7th in AVG, 4th in HR’s and 4th in RBI in the organization. • WE GOTCHA! !…Jackson catchers lead the SL catching 53.8% of base stealers (49 CS, 92 Att). The next closest is Birmingham which is throwing out 35.6% of base runners. The Generals biggest transaction over the All-Star break was picking up a new Pitching Coach in Dwight Bernard from Triple-A Tacoma. The Generals sent Terry Clark to to Tacoma. The coaching swap surprised many in baseball. Before Thursday’s game with Mississippi Bernard was our guest on Generals OnDeck. James Jones was 1-for-4 in last night’s Southern League All-Star Game in jacksonville. 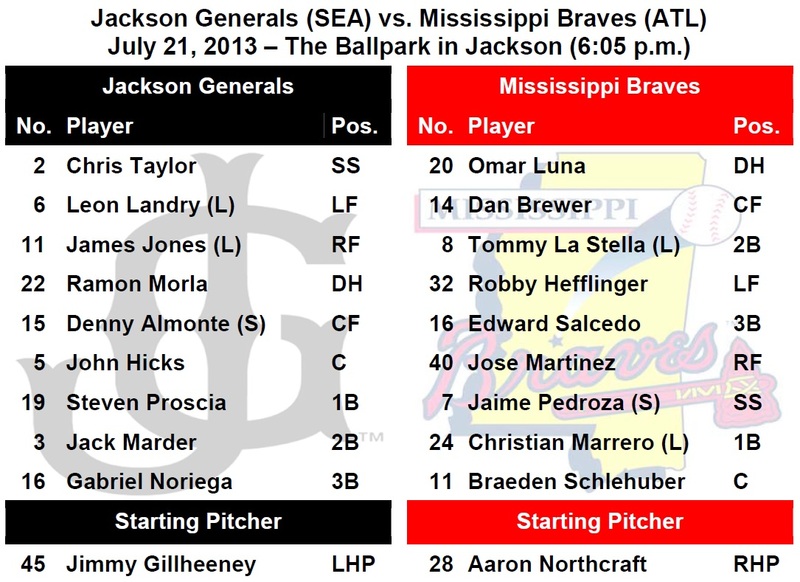 TODAY’S GAME: the Generals continue their 10-game homestand (0-5) tonight with game #1 of a 5-game series with the Mississippi Braves at The Ballpark in Jackson…this is the M-Braves’ first and only visit to Jackson this season. 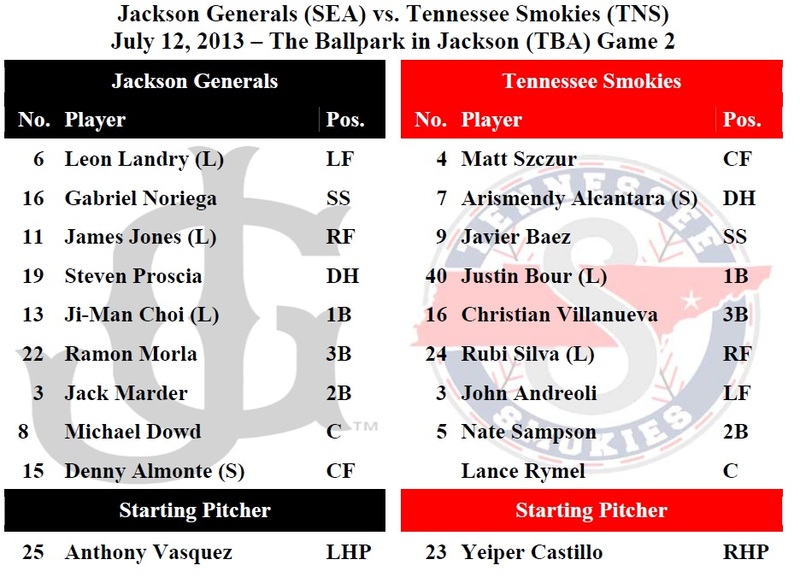 The Generals dropped 4 of 5 from the Braves at Trustmark Park, April 15-19…22-year-old LHP Anthony Fernandez makes his 14th start of the year, 90th of his career and 27th for the Generals tonight…this is Anthony’s 1st start of the season vs. MIS and in 2 career starts vs MIS he is 1-0 with a 3.00 ERA. DID YOU KNOW? : that despite Jackson’s 5-8 record in July, Generals’ pitching ranks 3rd in the Southern League this month with a 2.54 ERA. 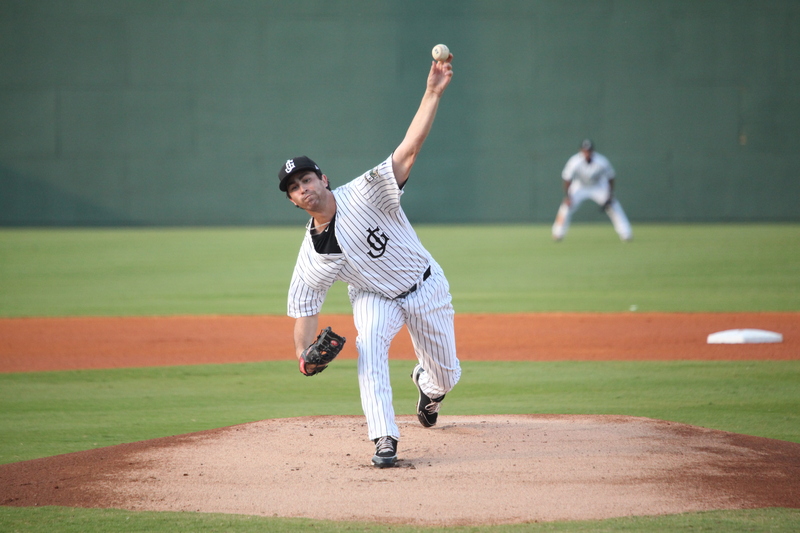 Generals pitching leads the league so far in July, holding opponents to just a .193 average. ALL-STAR GAME(S) RECAP: RF James Jones was 1×4 with a 2B for the North Division Wednesday night and had the only hit for his team during the North’s 6-0 loss to the South Division in Jacksonville. LH Roenis Elias pitched a scorless 4th inning, striking out 2 batters. 1B Ji-Man Choi was 0x2 after taking over in the 6th inning Sunday during the Futures Game in New York for the World team. Former General RH Taijuan Walker pitched a scoreless 2nd inning for the U.S. squad as the U.S. defeated the World 4-2 in the 15th Sirius XM Futures Game. GENERALS RECAP: Sunday’s game between the Generals and Smokies was cancelled because of rain and unplayable field conditions. The game will not be made up due to the teams not meeting again this season. The Smokies won all 6 games during the series, including the resumption of the game from June 28 and finished the season series with a 16-3 advantage. The Smokies won the last 8 in a row over Jackson. NEWS & NOTES: 35 of first 90 games have been 1-run games (13-22) which is the 5th in all of minors…49 of 90 games have been decided by 2-or-fewer runs (17-32) and 10 have been extra-inning games (3-7)…In games decided by 3+ runs the Generals are 22-18. • ALUMNI REPORT: 2012 General RHP Logan Bawcom has tossed 8.1 scoreless innings over his last 6 relieaf appearances for Tacoma, including recording a save in 5 of those outings. He currently leads all Mariners farmhands with 16 saves. • TAYLOR ADDING UP THE HITS: SS Chris Taylor recorded his 100th hit of the season on June 30 vs. Birmingham. He was the first Mariners farmhand to record at least 100 hits. He currently has 113 hits which ranks T-12th in all of Minor League Baseball. • CLOSING TIME: After allowing 5 runs over his first 6 appearances of the season, RH Carson Smith has allowed only 4 earned runs over his last 24 relief appearances. During this stretch he is 0-1 with 7 saves and a 1.50 ERA (4 ER, 26.0 IP). Since April 22, Smith has lowered his ERA from 8.44 to 2.59. Smith has struck out at least 1 batter in 27 of 30 games, including recording 15 strikeouts over his last 8 appearances. • ALL ABOUT THE JI-MAN: Quietly, 1B Ji-Man Choi is having one of the best seasons in the Mariners farm system. Overall this season in A+ and AA he is batting .301 (84×279) with 13 home runs and 57 RBI. He ranks 7th in AVG, 4th in HR’s and 4th in RBI in the organization. • WE GOTCHA! !...Jackson catchers lead the SL catching 53.8% of base stealers (49 CS, 91 Att). The next closest is Birmingham which is throwing out 35.6% of base runners. • BASEBALL AMERICA PROSPECTS: The Generals roster features 8 of the Mariners Top 30 prospects, according to Baseball America. Those include: RHP Carson Smith (16), OF Leon Landry (17), INF Jack Marder (20), C John Hicks (21), OF, OF Julio Morban (23), INF Chris Taylor (28), INF Ramon Morla (29) and LHP Anthony Fernandez (30). The Southern League All-Star Game takes place on Wednesday at Bragan Field at the Baseball Grounds of Jacksonville. Julio Morban, James Jones and Roenis Elias were selected from the Jackson Generals. Generals Manager Jim Pankovits manages his fourth All-Star Game and second in the Southern League. Pankovits was designated the task of making out the starting lineup for the North Division. He discussed his experiences playing against each player as well as other topics surrounding the game. Grant Braden talked it over with Jim Pankovits. Kyle Hunter tossed 5 scoreless innings during game 1 last night. 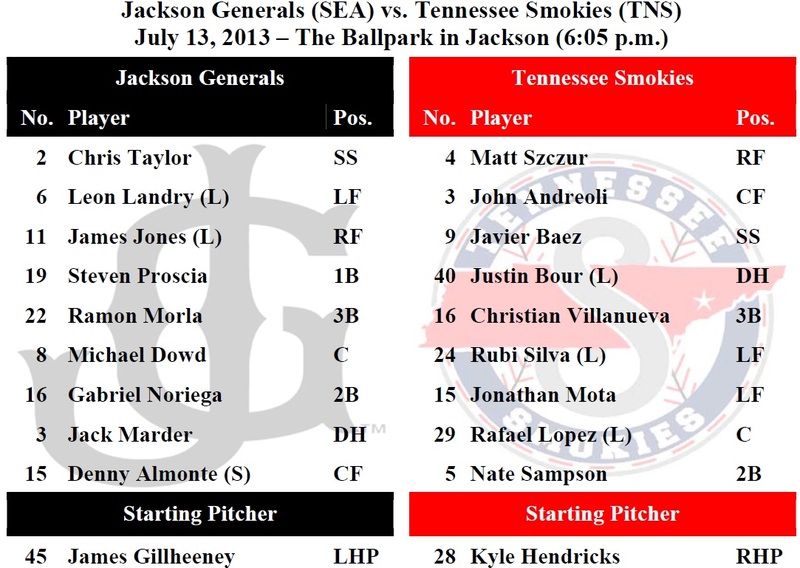 TODAY’S GAME: the Generals continue a 7-game series in 5 days against the Tennessee Smokies today with game #6 of the series (0-5)…the Generals are 3-15 against the Smokies this season and 1-9 against TNS at home this season… 25-year-old lefty James Gillheeney starts game 6 of the series….This is his 4th career start vs. TNS and is 0-2 with a 7.88 ERA in those games. DID YOU KNOW? : That Generals pitching allowed just 3 earned runs in 19 innings during yesterday’s doubleheader sweep by the Tennessee Smokies, which is a 1.42 ERA. Also Jackson pitching struck out 22 Smokies in those 19 innings. BACK TO THE FUTURE: Generals 1B Ji-Man Choi will miss tonight and tomorrow’s game due to playing in the 2013 Futures Game at Citi Field in New York on Sunday. Also, Smokies INF Arismendy Alcantara will miss the next 2 games as well being a teammate of Choi’s on the World squad. Former Jackson pitcher Taijuan Walker will be a member of the U.S. squad. The game will be at 1 p.m. CT on ESPN2. 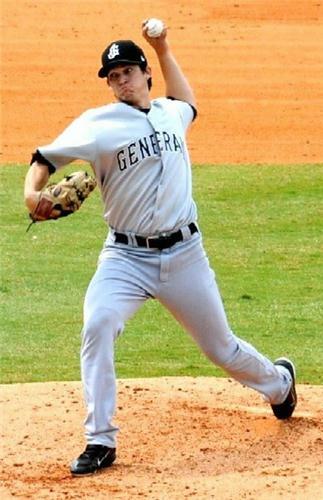 GENERALS RECAP: The Generals suffered a tough doubleheader sweep Friday at the hands of the Tennessee Smokies, as Jackson mustered only 1 run in 19 innings of baseball. Jackson pitching posted a 1.42 ERA in the doubleheader, but lost twice. Tennessee took the first game 2-0 in 10-inninns. They came right back in the nightcap and snagged a 2-1 victory in 9 frames. Starting pitchers Kyle Hunter and Anthony Vasquez combined to allow just 1 run in 12 innings on the mound. Both recieved no decisions. Jackson’s only run in the doubleheader came from a solo home run in the 3rd inning of game 2 from C Michael Dowd. It was his first Double-A homer. NEWS & NOTES: 35 of first 89 games have been 1-run games (13-22) which is the 5th in all of minors…49 of 89 games have been decided by 2-or-fewer runs (17-32) and 10 have been extra-inning games (3-7)…In games decided by 3+ runs the Generals are 22-17. • ALUMNI REPORT: Tacoma RHP Chance Ruffin suffered a loss in his 2013 Rainiers debut Friday night in Reno. The right-hander surrendered 4 runs on 5 hits over 4.1 innings, and struck out 3 with 3 walks issued. • HEY NOW, YOU’RE AN ALL-STAR: OF Julio Morban, OF James Jones and LHP Roenis Elias will represent Jackson on the North Division roster for the 2013 Southern League All-Star Game, which is scheduled for this Wednesday at Bragan Field at the Baseball Grounds of Jacksonville. RHP Taijuan Walker was also selected to the roster, but is unable to play due to his recent promotion to AAA Tacoma. • TAYLOR ADDING UP THE HITS: SS Chris Taylor has hit safely in 11 of his last 14 games with 6 multi-hit outings, batting batting .343 (18×49) with 8 runs scored, 3 doubles, 1 triple, 1 home run, 5 RBI, 3 stolen bases and 7 walks. Overall he has hit safely in 16 of 21 games after being promoted to Jackson from High Desert, batting .290 (23×79) with 12 runs scored, 5 doubles, 1 triple, 1 home run, 5 RBI, 12 walks and 5 stolen bases. Taylor recorded his 100th hit of the season on June 30 vs. Birmingham. He was the first Mariners farmhand to record at least 100 hits. • CLOSING TIME: After allowing 5 runs over his first 6 appearances of the season, RH Carson Smith has allowed only 4 earned runs over his last 22 relief appearances. During this stretch he is 0-1 with 5 saves and a 1.57 ERA (4 ER, 23.0 IP). Since April 22, Smith has lowered his ERA from 8.44 to 2.67. Smith has struck out at least 1 batter in 25 of 28 games, including recording 12 strikeouts over his last 6 appearances. • CHOI ADDED TO WORLD ROSTER IN FUTURES GAME: Generals 1B Ji-Man Choi was added a replacement for the World team at the Futures Game on July 14th at Citi Field in New York. Choi joins RHP Taijuan Walker at the game as Walker will be on the U.S. roster. • WE GOTCHA! !…Jackson catchers lead the SL catching 52.3% of base stealers (46 CS, 88 Att). The next closest is Birmingham which is throwing out 35.6% of base runners. Ji-Man Choi blasted his 6th Jackson home run in last night’s loss. 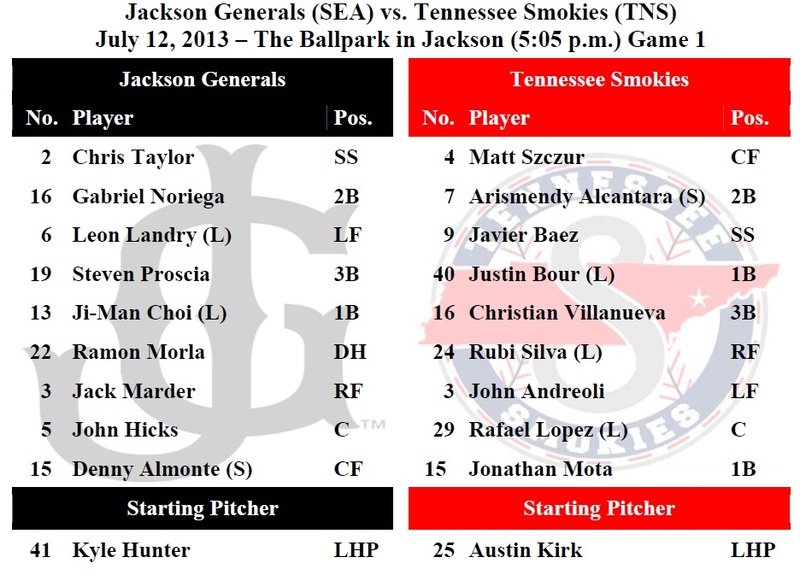 TODAY’S GAME: the Generals continue a 7-game series in 5 days against the Tennessee Smokies today with a doubleheader including game #4 and #5 of the series (0-3)…the Generals are 3-13 against the Smokies this season and 1-7 against TNS at home this season… 22-year-old lefty Kyle Hunter makes the spot start in game 1 of the DH vs. Tennessee. This is Hunter’s 3rd career start and 2nd of the 2013 season. In 22 games this season he is 1-0 with a 1.44 ERA and 1 save… 26-year-old lefty Anthony Vasquez makes his 4th Jackson start of the season and 7th total on the season in game 2. In 2 starts so far in July Vasquez is 1-0, with a 0.75 ERA. In 3 career starts vs. TNS he is 1-0 with a 3.18 ERA. GENERALS RECAP: The Generals dropped their third straight to the Tennessee Smokies on Thursday night, 4-1. The loss marked the 6th straight loss to Tennessee and 13th in 16 meetings. DH Ji-Man Choi tallied 2 hits and added his 6th homer of year to lead Jackson offensively. Alberto Cabrera earned his league-leading ninth win for Tennessee. LH Roenis Elias (L, 5-8, 6.0,7,3,3,4,6) suffered the loss for Jackson despite a quality start. RH Stephen Shackleford (2.0,1,0,0,0,0,2) tossed a scoreless 7th and 8th out of the pen, while RH Carson Smith (1.0,1,1,0,0,2) surrendered an unearned run in the 9th inning. NEWS & NOTES: 34 of first 87 games have been 1-run games (13-21) which is the 5th in all of minors…47 of 87 games have been decided by 2-or-fewer runs (17-30) and 8 have been extra-inning games (3-5)…In games decided by 3+ runs the Generals are 22-17. • ALUMNI REPORT: INF Kyle Seager was 2×5,R,HR,2 RBI yesterday vs. Boston and extended his hitting streak to 11 games with a homer in the 2nd inning (since 6/30), batting .442 (19×43) with 11 runs scored, 2 doubles, 4 home runs, 9 RBI, and 5 walks during that stretch. • BLACK JACK HOT IN JULY: INF Jack Marder hit .194 in April, .188 in May and .167 in June but has opened the month of July batting .348 (8×23) with 1 home run, 3 RBI and 3 runs scored. • SECOND HALF SURGE: After batting just .191 in the first half, INF Steven Proscia is batting .302 (13×43) with 3 doubles, 3 home runs and 9 RBI. Proscia leads the club with 7 home runs on the season. • HEY NOW, YOU’RE AN ALL-STAR: OF Julio Morban, OF James Jones and LHP Roenis Elias will represent Jackson on the North Division roster for the 2013 Southern League All-Star Game, which is scheduled for July 17 at Bragan Field at Baseball Grounds of Jacksonville. RHP Taijuan Walker was also selected to the roster, but is unable to play due to his recent promotion to AAA Tacoma. • TAYLOR ADDING UP THE HITS: SS Chris Taylor has hit safely in 10 of his last 12 games with 6 multi-hit outings, batting batting .377 (17×45) with 8 runs scored, 3 doubles, 1 triple, 1 home run, 5 RBI, 3 stolen bases and 7 walks. Overall he has hit safely in 15 of 20 games after being promoted to Jackson from High Desert, batting .297 (22×74) with 12 runs scored, 5 doubles, 1 triple, 1 home run, 5 RBI, 12 walks and 5 stolen bases. Taylor recorded his 100th hit of the season on June 30 vs. Birmingham. He was the first Mariners farmhand to record at least 100 hits. • WE GOTCHA! !…Jackson catchers lead the SL catching 52.3% of base stealers (46 CS, 88 Att). The next closest is Birmingham which is throwing out 35.0% of base runners.